Media personality, Toke Makinwa wins big after placing a bet on France to win in the just concluded 2018 FIFA World Cup held in Russia. She unarguably is one of the happiest women in the world right now. 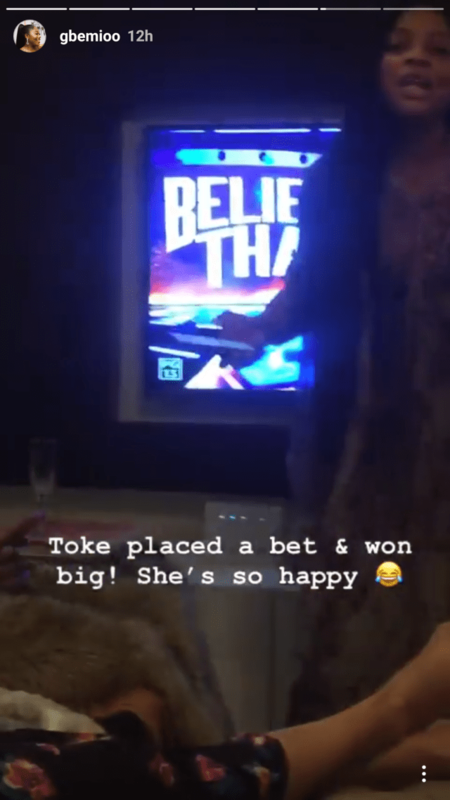 Toke Makinwa was spotted in a video shared by popular Beat FM OAP, Gbemi showing off her excitement over the outcome of the final match in 2018 World Cup. Toke is now N7.2m richer after her bet on France to win the World Cup. The French national team was crowned world champions after defeating an underdog Croatian team 4-2 in the World Cup final in Moscow on Sunday, capturing its second World Cup title and its first since it hosted the 1998 tournament 20 years ago..